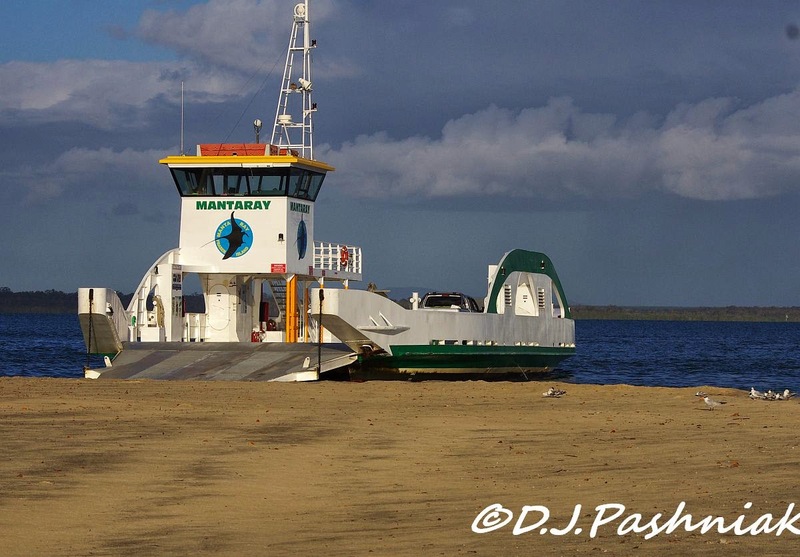 ...or simply the barge waiting at the end of the spit for vehicles to take over to Fraser Island. Of course there are always some birds - even if often they are over on the sand island where it is impossible to get more than a distant photo of them. The other morning I could see numbers of terns over there. Their white color showed up well against the darker color of the shorebirds. It was early in the morning and suddenly they all took off and headed out to sea where they would fish for most of the day. 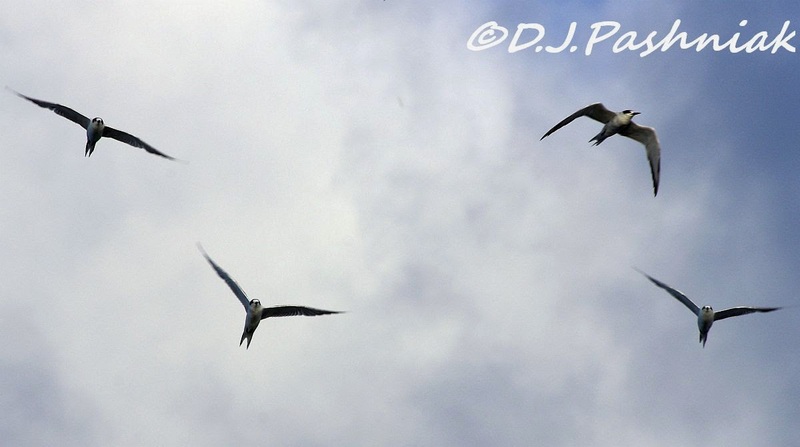 As soon as they flew over I could see that most of this flock were Common Terns (Sterna hirundo). They are one of the migratory terns which come down here for the summer. The ones we commonly see are Sterna hirundo longipennis - the more common European form is rarely sighted. Common Terns breed up in Asia and they will soon be leaving here. As the main flock flew over a few came down and joined a mixed flock that were roosting on the spit. Even these did not stay long as the barge and more traffic disturbed them. It is a pretty place and the birds are great. Cool shots of the Terns. Neat seeing the large flock of Terns! Wonderful photos, have a happy week! Thanks for commenting Eileen. It is a place I do not get tired of visiting. they have such sharp wings and tails. neat to see such a large flock! Thanks for commenting Therese. 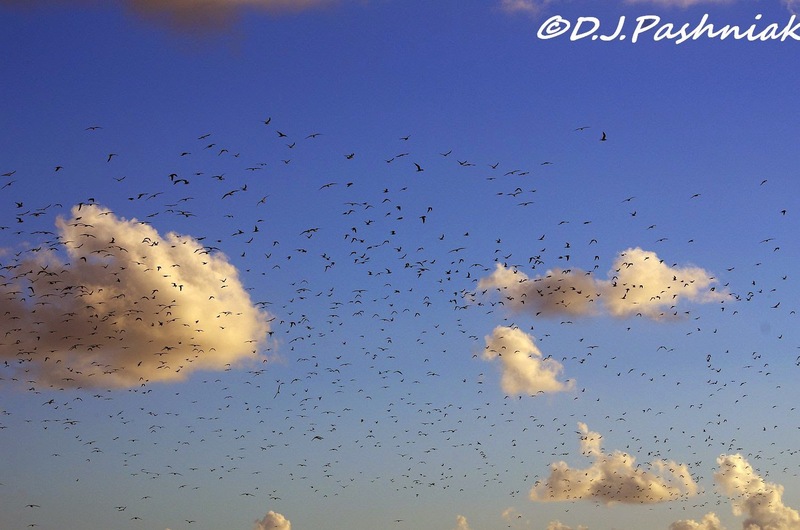 I was lucky to be there at the right time as flocks of that size are not always around. Thanks for commenting Carol. It would be hard to take a poor photo at such a beautiful place! What dramatic photos of the terns in the sky. Their tails make them look so sleek and graceful. I can see why you frequent this spot. Thanks for commenting Cynthia. Terns to me are the perfect bird athletes. Wonderful to see al those terns together and I can only imagine the noise they would all be making. Our Sandwich Terns are due back from Africa any day now, with Common and Arctic terns following not far behind. Hi Phil, the really noisy ones among the Terns are the Crested Terns which stay here most of the year - just move off-shore to breed - and their juveniles are so noisy they block out pretty much everything else! After them the Commons are a relief! Thanks for commenting Findlay and I also think that huge flocks are very interesting. Really stunning photos and elegant birds. Thanks for your comment Christian and I agree that they are very elegant birds - especially in-flight! Lovely shots of the flying terns. I can imagine they were very noisy. Thanks for commenting Gunilla - I guess all terns are noisy! HI Mick What a wonderful number f birds that have collected together. great shots of them. Thanks Margaret. 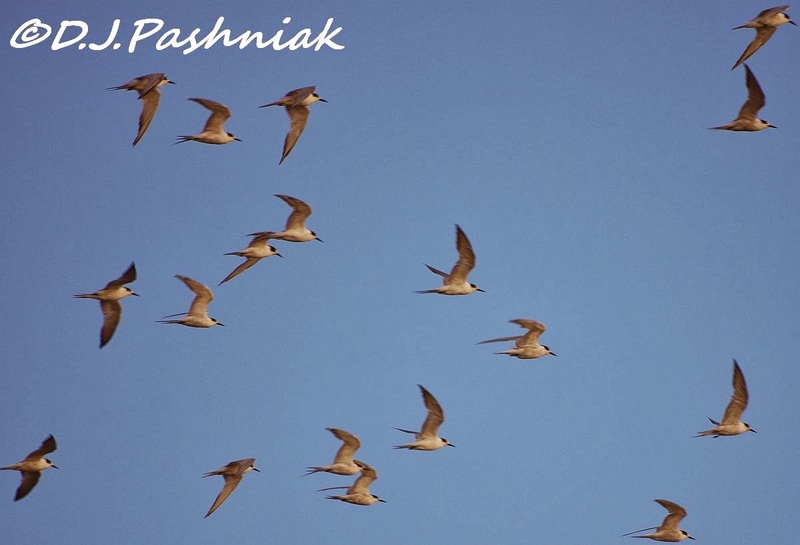 Migrating birds do collect into huge flocks. 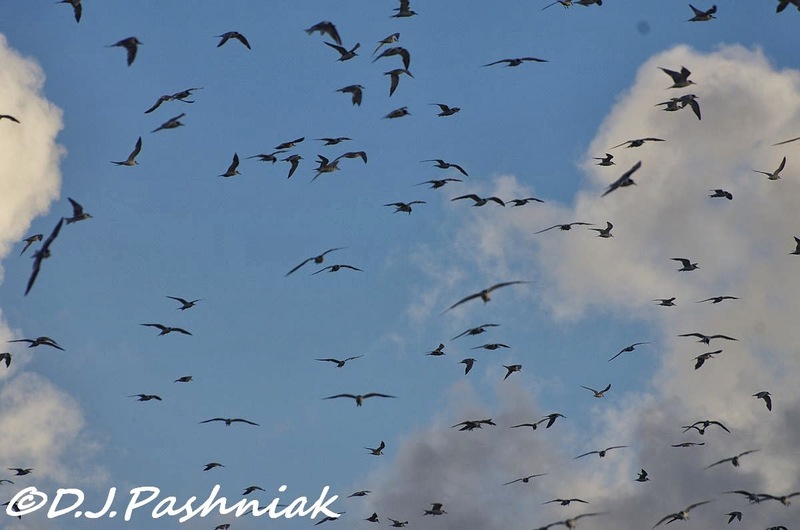 fabulous shots; so many birds! That's a lot of birds! Love that 7th shot, the sky looks peppered with birds! Thanks for your comment Karen - and it looks even more birds when you are standing nearly under their flight path. I needed my wide angle lens on. You always have such interesting photos of your Lake and area. I think I would like your spit!!! wow, that´s a lot of them. I have never seen that many terns at one time. Where I live there might be 4 or 5 but rarely more of them at one location. Nice to see this. Hi NF - We don't have huge flocks of terns all season but I think this might have been a flock migrating northwards and they sometimes stay around here for a few days. Well, if you can't have waders, terns are a nice replacement. Thanks for commenting Stewart. They can be just as challenging in their fine details as shorebirds. I've been enjoying browsing your Blog, and I hope you don't mind but I'm now a Follower. I used to live in Hervey Bay, so reading through your Blog brings back good memories, plus it's also interesting. I noticed too you also Follow 'Snails Eye View', I find her Posts are always such fun to read as well as informative. Wow, what a time you had watching all those birds in flight. Wonderful photos. It's so nice to live near the sea, I quite often miss being nearby. Always a pleasure to wander along the foreshore or feel the salt water on my skin, or simply breathe in the salty air early in the morning. Well I've been a bit nostalgic, but I do thank you for the remembering opportunity. When I have more time I'll be wandering around your images and stories of Sandy Straits and Beyond. Thanks for visiting me, so glad you did. I've enjoyed being here. 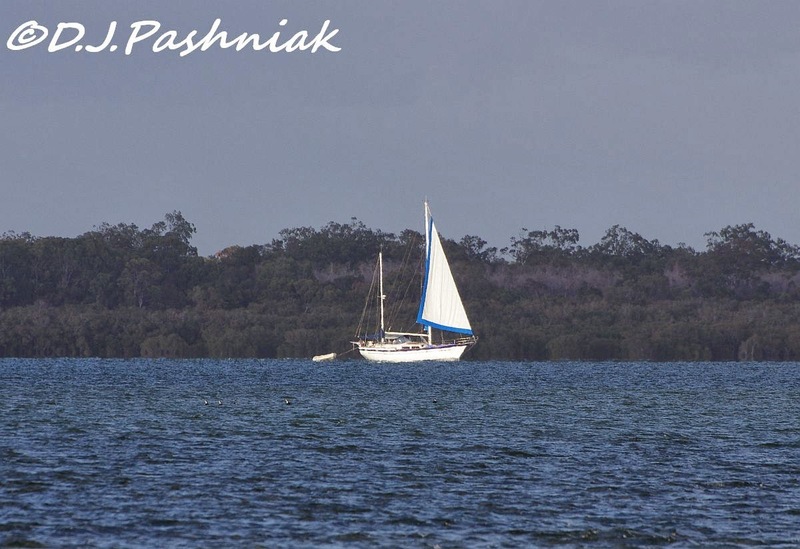 Hi Magda, thanks for visiting and commenting and I'm glad my blog brought back happy memories for you of when you lived in Harvey Bay. A lot of the habitat around here is similar to that around Harvey Bay but we don't have the density of population that is now in Harvey Bay. There are a lot more housing developments planned for this area - but I hope it is a long time before they happen and fill up with people. I enjoy this area just the way it is. May it be a very long time, even never, that your area becomes overpopulated and overbuilt Mick. I photographed a whole lot of Common Terns down on the rocks at Burleigh about a month ago. They were happily sunning themselves amongst the Crested Tern colony. I'd never seen them before. What a wonderful series, Mick!